Black is bold, and always makes a big statement in any space. Decorating with it can give a room a rich and structured feel, and any black surface is sure to stand out. Black has the power to make a room feel expansive when used correctly. If you’d like to introduce a touch of black to your décor, black window shades are an excellent place to start. Here are a few of our favorite ways to use dark window treatments that are appropriate for any interior design style. For subtle black tones, sheer shades like Solar Shades and Light Filtering Roller Shades add color while still allowing natural light into the room. 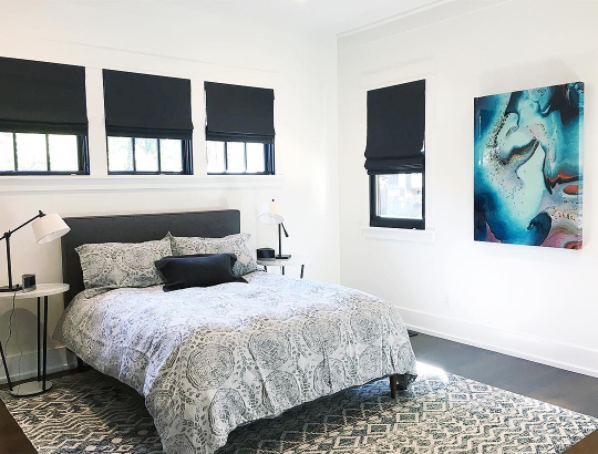 The Solar Shades shown above coordinate with the black chair, window trim, and artwork, but merely reduce the glare from the large window while leaving the beautiful view unobstructed. When raised, the shade retracts into a small roll that blends into the window frame. 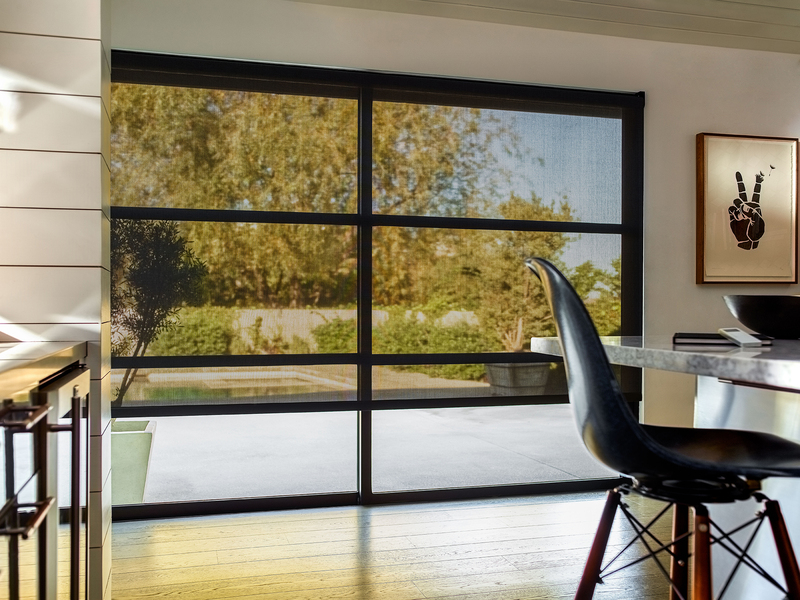 Black Solar and Roller Shades are an ideal choice if you like minimal window treatments that are practically invisible when raised. Roller Shades shown in Desert Flower with Grommet Drapery shown in Suede. To achieve the opposite look, patterned black shades can also act as a statement piece. If the rest of the space is neutral, a large swatch of black won’t feel overwhelming. 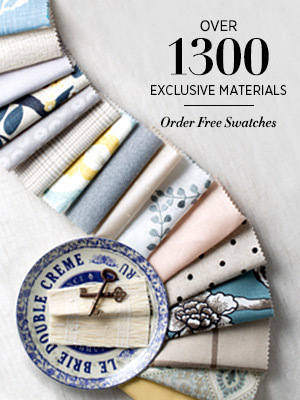 Rich patterns like Desert Flower temper the black, so even large shades still appear soft and not stark. A great designer trick is to layer a patterned shade, like the Roller Shades shown above, under neutral curtains for a multidimensional layered look. In the bedroom, the combination of blackout shades and blackout lined curtains also block light and help improve sleep. If you have your heart set on true black shades, use the window treatments to pick up on a few other black accents in the room. This black and white bedroom by M.A. 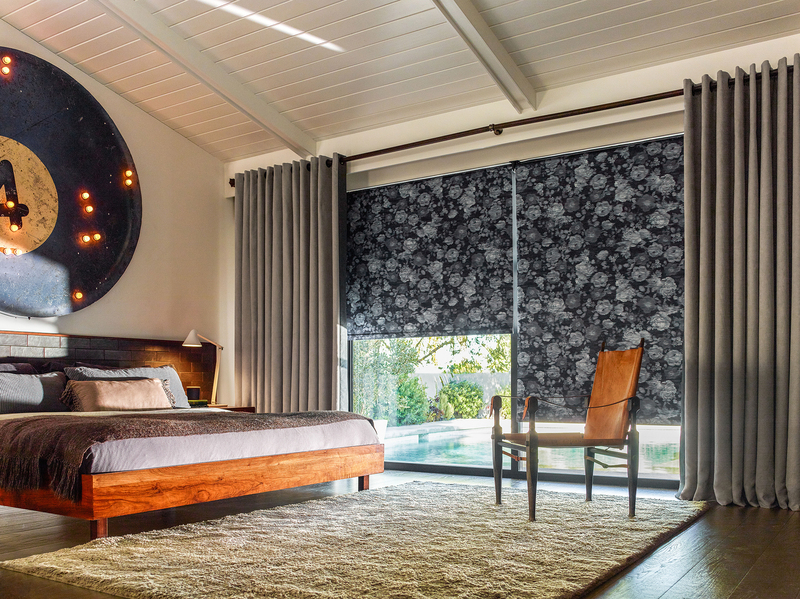 Mitchell design features black Flat Roman Shades paired with crisp white walls, patterned bedding, and a black headboard. Black and white is always a classic color combination, but the same principle works with other lighter neutrals as well. By limiting the amount of other black items in the space, you can keep your room looking bright and spacious even with black window shades. 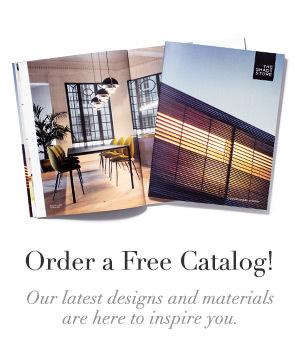 Order free swatches of any of our black materials online or pick them up in one of our nationwide showrooms, then hold them up to your windows and furniture. 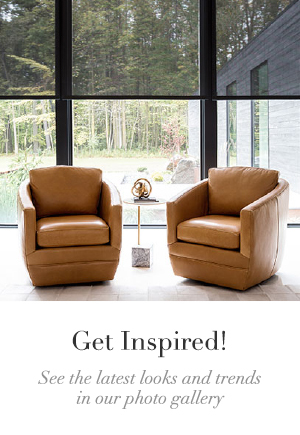 Our expert Design Consultants are happy to help you choose the right black look for your home.